What is the leg support AS-PU-02? AS-PU-02 is an anatomic-shaped calf sleeve with Y-shaped straps and silicone pressure relief zone. The straps can be adjusted what allows to set the required level of compression. 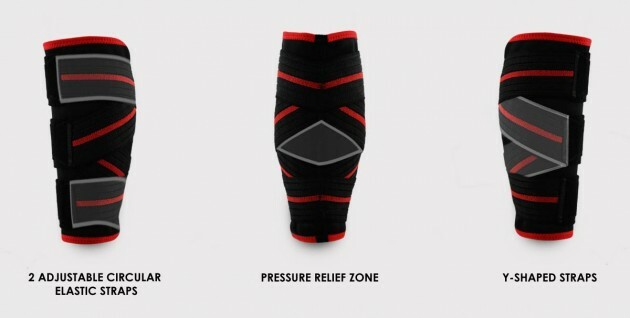 Besides, the brace has special relief zone that supports and protects the highly sensitive injury area. The silicon in AS-PU-02 has special design for vibration dampening with every motion. Elastic straps provide additional adjustable compression to stimulate blood circulation, promotes regeneration and reduces the pain without covering the injured area. What’s more, 2 adjustable circular elastic straps and silicone insert keep out AS-PU-02 support in place. Our calf support AS-PU is made of innovative, high-compressive and skin-friendly material, called CottonPren. It’s soft and high-elastic, what provides excellent compression. This material is made of neoprene with internal elastic terry. Orteza podudzia należy do grupy 4SPORT, została wykonana z innowacyjnego surowca CottonFit. Jest to bardzo nowatorskie podejście do produkcji wyrobów ortopedycznych. Surowiec ten jest surowcem trójwarstwowym składającym się elastycznego spandexu, elastycznego rdzenia wewnętrznego oraz z puszystej, bawełnianej dzianiny CottonPlusz.